Step it up this Christmas with Shoes for Her! 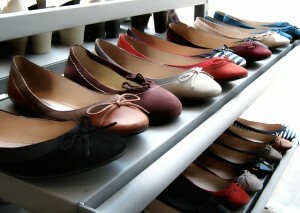 Home » Blog » Step it up this Christmas with Shoes for Her! While I am not exactly an avid shoe enthusiast myself, I’ll have to admit that even I adore the occasional pair of fabulous shoes! When you open the closets of my three daughters, however, prepare yourself to be amazed. With fantastic shoes to match each and every outfit, suitable for every possible event that may occur, in every shape, style and color, my daughters could very possibly open up their own shoe store! Even still, each year when I ask them for a list of things they want most for Christmas, it never fails; somewhere on the top ten of their list is- you guessed it- shoes. Maybe their fascination with shoes is just an aspect of their irresistible desire to the the most fashionable girls in town, or maybe it has something to do with the stories my mother has told them of her youth. Mom lived with her grandmother growing up, and there wasn’t a lot of money to go around. Often times, she did without the things that she needed because there simply wasn’t any choice. My mother has told stories of how she had to place cardboard in the bottom of her shoes or use duct tape to seal the holes in her shoes in order to protect her feet from the wet snow and winter rains. One Christmas, my grandma was finally able to place a Christmas gift under the tree for my mom. She had saved for months for this special gift. Imagine my mom’s joy when she received a brand new pair of shoes for Christmas. If you have a shoe fanatic on your holiday shopping list and you are considering purchasing shoes for her this Christmas, you’ll be delighted to know that there are an abundance of fabulous shoes available this season, so finding just what she wants should be a breeze. Before you begin searching for shoes for her this Christmas, there are some things that you should consider. One of the first things that you should consider is what type of shoes you intend to buy. Are you planning to search for boots, running shoes, every day heels or fantastic glamorous shoes for a special occasion? Consider the personality of the lady in your life. Is she sporty, trendy or worried about comfort before fashion? Does she like fashionable shoes that compliment her wardrobe, or would she prefer shoes that make a big impact? Although I am sure that you are aware that you need to have an idea about her shoe size before you purchase shoes for her this Christmas, it is important to remember that the actual size of various brands and styles can vary significantly. Read reviews to see if the particular shoes of interest are typically sized larger, smaller, or close to the stated size, and be sure that they can be exchanged easily in the event that they do not fit properly. Is there a particular color of shoes that you think she would prefer? Are you adding shoes to a particular outfit to create a unique Christmas gift this holiday season? Or are you searching for something that goes well with multiple pieces in her wardrobe? Do you have a special story about Christmas shoes?